Audi’s A7 didn’t start the modern coupe-like sedan trend, but with its muscular proportions, beautiful surfacing and Kammback rear it managed to make us almost forget the segment’s progenitor, the Mercedes-Benz CLS. The handsome four-door has been redesigned for the 2019 model year, though so far we’ve only been treated to the regular A7. Sporty S7 and high-performance RS 7 models are still in the works. Today we have new spy shots of the S7, which judging by the lack of camouflage gear should be making its debut soon. We know this prototype is for the S7 because of its massive wheels and brakes. A close up on the front wheel reveals a brake disc that almost fills the entirety of the wheel housing and a caliper that almost spans the diameter. There are also four exhaust tips at the rear, a signature design cue for Audi’s S cars. It’s not clear what engine is lurking beneath the hood but a safe bet based on the exhaust note in the spy video is the Volkswagen Group’s new 2.9-liter twin-turbocharged V-6 that made its debut in the current Porsche Panamera 4S, where it delivers a healthy 440 horsepower. A similar output, along with an eight-speed automatic transmission, should feature in the S7. Despite dropping the current S7’s V-8 in favor of a more efficient V-6, performance should be maintained. Expect the 0-60 mph time to match or better the current S7’s 4.3 seconds result. Top speed should remain capped at 155 mph. 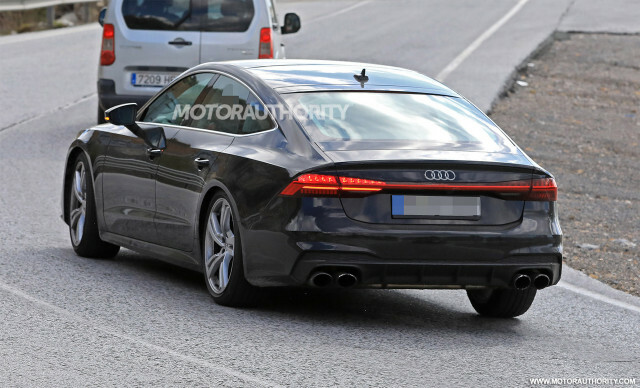 V-8 fans can look forward to the new RS 7. This one should feature a version of the VW Group’s 4.0-liter twin-turbocharged V-8 that made its debut in the 2017 Panamera Turbo, possibly with an electric compressor thrown in to reduce lag (the technology is already available in several models including the SQ7 TDI sold overseas). A plug-in hybrid e-tron model is expected at some point as well. 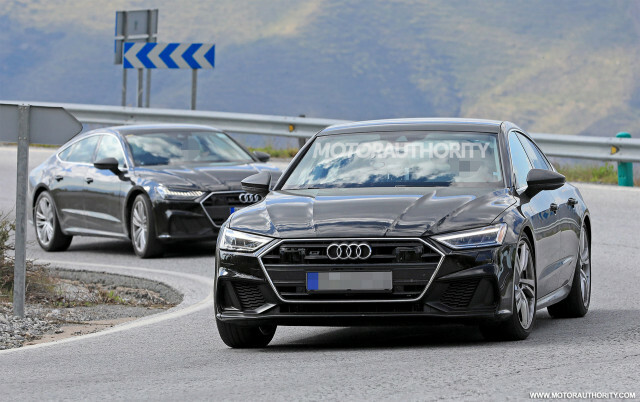 Inside the cars will be the high-tech cabin of the regular A7 but with better bolstered seats and unique trim options. Audi’s newest interior concept features two touchscreens (10.1 and 8.6 inches) in the center stack through which most commands are executed. A third screen measuring 12.3 inches serves as the instrument cluster. Look for the debut of the S7 later this year. It should arrive as a 2019 model.